The following article originally appeared as “John Szarkowski Is CAA Distinguished Scholar” in the January 2006 CAA News. The Distinguished Scholar Session at the 2006 Annual Conference in Boston honors John Szarkowski, director emeritus of the Department of Photography at the Museum of Modern Art (MoMA) in New York. 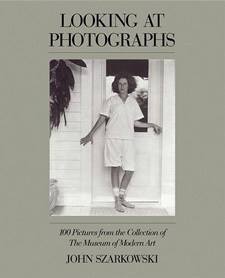 As director of MoMA’s Department of Photography from 1962 to 1991, Szarkowski oversaw more than one hundred exhibitions, the publication of more than thirty books and catalogues, the inauguration of the museum’s first photography collection galleries in 1964 and their expansion in 1984, the establishment of endowments to support the department’s programs, and the continued development of the collection, which now includes more than twenty-five thousand works spanning the history of photography. The exhibitions Szarkowski organized at the museum ranged from presentations of new work to retrospectives of major figures, and from considerations of the formal vocabulary of photography and its varied applications to broad surveys of important historical episodes. Many exhibitions were accompanied by publications edited and often written by Szarkowski. Among the most important are: The Photographer and the American Landscape (1963), The Photographer’s Eye (1964; publication 1966), New Documents (1967), The Animals: Photographs by Gary Winogrand (1969), From the Picture Press (1973), New Japanese Photography (1974; with Shoji Yamagishi); Photographs by William Eggleston (1976), Mirrors and Windows: American Photography since 1960 (1978), Photography until Now (1990), and Lee Friedlander: Nudes (1991). Retrospectives have surveyed the work of André Kertész (1964), Dorothea Lange (1966), Brassaï (1968), Henri Cartier-Bresson (1968), Bill Brandt (1969), Walker Evans (1971), Diane Arbus (1972), Harry Callahan (1976), Eugene Atget (1981–85 in four parts, with Maria Morris Hambourg); Irving Penn (1984); and Gary Winogrand (1988). In 1985, Szarkowski inaugurated the annual New Photography series, which introduced the work of dozens of artists in the following fourteen years. In June 2003, MoMA issued a Russian edition of Szarkowski’s highly acclaimed book, Looking at Photographs, an introduction to the history and aesthetics of photography first published in 1973. The new edition was issued to accompany Szarkowski’s exhibition based on the book, which was on view at the State Hermitage Museum in St. Petersburg and the State Pushkin Museum of Fine Arts in Moscow in 2003. In addition to Ansel Adams at 100, Szarkowski’s other MoMA exhibitions since 1991 have included Alfred Stieglitz at Lake George (1995) and Come Sunday: Photographs by Thomas Roma (1996). 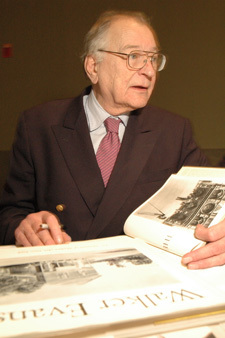 Szarkowski holds honorary doctorates from the Philadelphia College of Art (1965), the school of the Minneapolis Institute of Arts (1978), the Portland School of Art (1980), Parsons School of Design (1988), Northland College (1990), the University of Wisconsin (1991), Massachusetts College of Art (1993), and Columbia College Chicago (2001). He is the recipient of the City of New York Mayor’s Award of Honor for Arts and Culture (1979), the Friends of Photography Award for Distinguished Career in Photography (1988), the International Center of Photography Infinity Awards for Writing (1989) and Lifetime Achievement (1995), the Association of Independent Photography Dealers Lifetime Achievement Award (1992), the Royal Photographic Society Progress Medal (1992), and the National Arts Club Gold Medal for Photography (1998). Szarkowski has taught at Columbia, Cornell, Florida International, Harvard, Yale, and New York Universities, the University of Wisconsin, Bennington and Williams Colleges, the Sterling and Francine Clark Art Institute, and the University of Arizona, where he was appointed the first Ansel and Virginia Adams Visiting Scholar at that school’s Center for Creative Photography. Before joining MoMA, Szarkowski received two Guggenheim fellowships in photography, which he used to produce The Idea of Louis Sullivan (1956; reissued in 2000 by Bulfinch Press) and to photograph the Quetico wilderness area of western Ontario. Supported by a grant from the University of Minnesota Press, he made the photographs and wrote the text for The Face of Minnesota (1958). During these years, his work was widely exhibited, including one-person shows at the Walker Art Center (1949, 1958), the George Eastman House (1952), and the Art Institute of Chicago (1961). Szarkowski returned to picture making in 1991 and during the past decade has photographed throughout the United States. Mr. Bristol’s Bam, a book of his photographs, was published in 1997. Pace/MacGill Gallery in New York has presented his work in two solo exhibitions (1995 and 1999) and in a joint exhibition with Lee Friedlander (2000). Szarkowski was born in Ashland, Wisconsin, in 1925 and received his bachelor’s degree from the University of Wisconsin in 1948. This special panel is chaired by Joel Snyder of the University of Chicago and includes Peter Galassi, MoMA; Michael Fried, Johns Hopkins University; and André Gunthert, professor at the École des hautes études en sciences sociales, directeur of the Laboratoire d’histoire visuelle contemporaine; secretary of the Société française de photographie, and editor of Études. The session took place on Thursday, February 23, 2006, 2:30–5:00 PM in Ballroom B of the Hynes Convention Center.